and Henderson (1998) suggested that the nitrate concentration of the sea might have increased either because of elevated nitrogen fixation triggered by iron input to the ocean surface or reduced denitrification in the Pacific Ocean and the Arabian Sea (Altabet et al., 1995; Ganeshram et al., 1995). The relatively long residence time of oceanic nitrate offers an explanation as to how CO2 can continue to increase after the dust flux has dropped to its interglacial rate, but many uncertainties about the nutrient cycles and palcoproductivity remain to be settled before we can establish a fully coherent theory of past atmospheric CO2 changes. We now turn to the temporal evolution of the oceanic circulation. The major components of the preccssional and obliquity cycles arc present in power spectra of all Quaternary paleoclimatic records derived from marine sediments. These records exhibit periodicities of 19, 23, and 41 kyr, which are statistically significant at the 95% confidence level and arc invariant with respect to induced chronological errors in chronostratigraphy (Imbrie et al., 1993; Imbrie et al., 1992). However, superimposed on these long-term variations, abrupt climatic changes have recently been evidenced in most geological records. 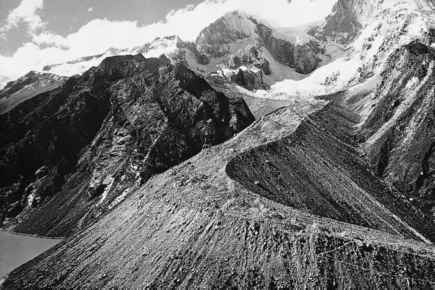 They suggest that the climate system consistently and frequently changes between near-glacial and near-interglacial conditions in periods of less than a few decades. Labeyrie et al. 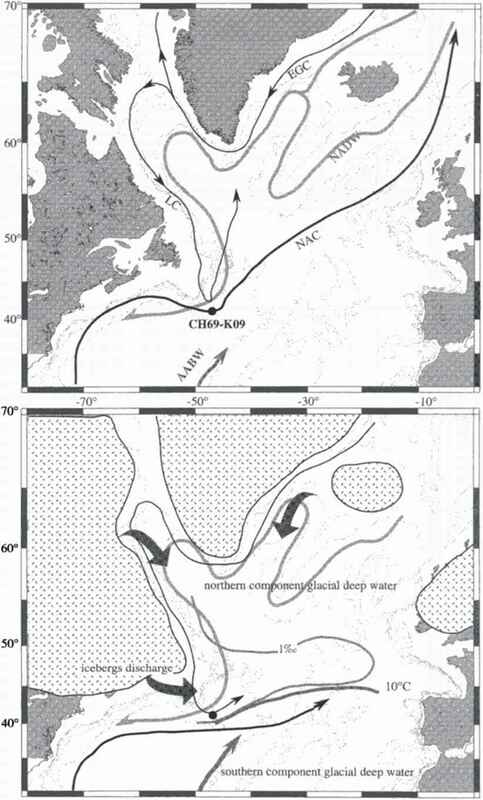 (1998) made a detailed study of a sediment core from the northwest Atlantic (CH69-K09, 41°45'4 N, 47c21' W, 4100 m water depth), which is located at the foot of the Newfoundland margin, between the northern limit of the North Atlantic current and the southern limit of the Labrador current (Figure 14.9, upper map). Figure 14.9. Upper map: location of corc CH69-K09 and modern surface and deep circulation. EGC = East Greenland current, LC = Labrador current, NADW = North Atlantic deep water, AAI3YV = Antarctic bottom water, NAC = North Atlantic current. Lower map: surface and deep circulation during glacial periods. The ice-sheets extension, maximum melting /one of the Hcinrich events, and the 10 °C isotherm are represented. 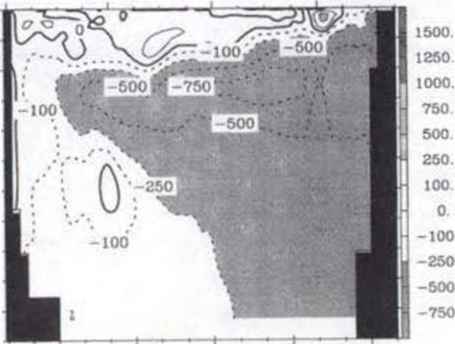 I.argc arrows indicate the location of potential iccbcrg discharges (from I^bcyrie et al., 1998).